ASP Executive Director Ranil Sorongon was elected as member to the 21 Member Sectoral Council of the National Anti-Poverty Commission, Persons with Disabilities (NAPC-PWD). The PWD Sectoral Assembly election was participated by 65 PWD leaders and parents of children with disabilities from 17 regions of the country. The event took place last February 5 -7, 2010 at the Manila Bay View Hotel. Being the only Parent Support Organization present among the 8 National Federations of PWDs, ASP was granted an automatic slot to join the assembly. ASP’s membership means children with intellectual disabilities and their families will be represented and will be assured that their issues and concerns will be heard and addressed. ASP will engage the different PWD leaders of the regions to look into the welfare of children with disabilities and partner with ASP to reach to families affected with autism in their locality. 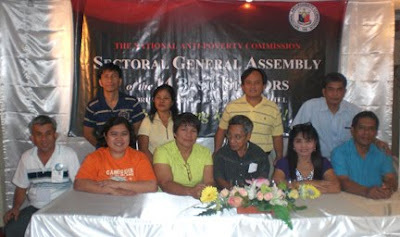 The National Anti Poverty Commission (NAPC) was created thru the Republic Act 8425, the Social Reform and Poverty Alleviation Act of 1998, better known as the NAPC Law. The Sectoral Council (SC) is the highest consultative, deliberative and policy review and formulation body of each of the 14 basic sector on anti poverty and right based issues for the respective sector. The SC is the Basic Sector Wing of NAPC tasked to also engage with any government agency to promote and advocate for the welfare of the PWD sector. The SC of the PWD sector decided to adopt the United Nations Convention on the Rights of Persons with Disabilities (CRPD) as its main advocacy instrument in engaging with the Philippine Government.